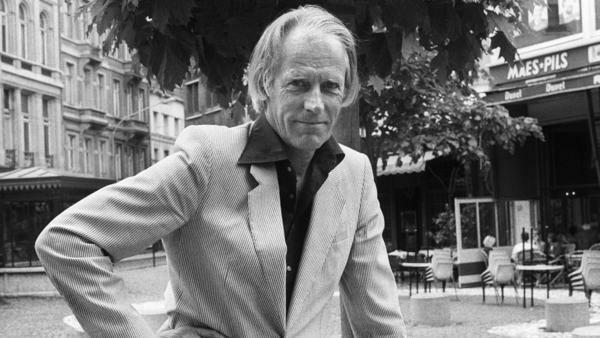 Sir George Martin, seen here in 1984, was known for his crucial role in shaping the sound of the Beatles. "He invented the job," Godrich says. "He invented that thought process of possibility." Godrich, who produced McCartney's 2005 album Chaos and Creation In The Backyard, says one of Martin's great talents was arranging. "As an arranger you write the notes," Godrich says. "You listen to the music that exists and you score your parts using the orchestra. So he was very much a musician, countless times on Beatles records." His influence, says Godrich, is "everywhere. It's all over them." Martin was known for experimenting in the studio. In 1998 he told NPR about the first time the Beatles played him a version of "Please Please Me." He hated it. "A real dirge," Martin said. "It was very very slow, very boring. I said, 'Look, if you double the speed of that, you might have something, but otherwise, forget it.'" The Beatles took his advice, and "Please Please Me" became a hit. George Martin's total embrace of music began well before he met the Beatles in the early 1960s. After serving in World War II, he studied composition and orchestration, piano and oboe at London's Guildhall School of Music. He recorded jazz artists, Scottish dance bands and comedy albums. He brought all of that knowledge and experience to the Beatles. It was Martin's idea, for example, to add strings to "Yesterday" and "Eleanor Rigby." In his autobiography, Martin said that when John Lennon played him a demo of "Strawberry Fields Forever," it was a "lovely," "gentle" song. He told Lennon he thought it should stay that way. But Lennon wanted to turn it into a heavy rock number, with drums, bass and electric guitars. Martin lost that battle, at first. The band recorded the song Lennon's way. A week later, Lennon admitted he'd been wrong. Martin said he went on to score "Strawberry Fields Forever" with cellos and trumpet. After much back and forth between him and Lennon — editing different recordings of the song — eventually, Martin told NPR, "Strawberry Fields" became one of his favorite songs. "I was completely enchanted with that song," Martin said. "I thought the lyrical imagery, and the musical construction, too, were something that I hadn't heard before, and I thought John was going into a wonderfully fertile field." The best producers find the balance between texture and simplicity. They know when to make a song more robust and when to keep it uncomplicated. Martin had so many musical ideas and tools at his disposal. He could add layers, experiment with speed, play tape backward, add instruments. But he also knew when to stop. "If you keep adding colors," he told NPR, "you start getting muddy, and they run, and it gets indistinct. If you can get your effect with a certain degree of cleanliness, then I think it's much better than overloading things." Small wonder that so many producers would agree with Nigel Godrich, who calls Martin his "spiritual godfather." Beatles fans are paying tribute to the group's longtime producer. George Martin died yesterday at the age of 90. In a statement, Paul McCartney said, the world has lost a truly great man who left an indelible mark on my soul and the history of British music. As NPR's Elizabeth Blair reports, Martin also left a lasting mark on the art of producing. ELIZABETH BLAIR, BYLINE: Whether it was horns or harpsichord, so many of those embellishments you hear on Beatles songs came from Sir George Martin. BEATLES: Roll up; roll up for the Magical Mystery Tour. Step right this way. BLAIR: George Martin wasn't just a good producer. NILES GODRICH: He invented the job. He invented those things - that thought process of possibility. BLAIR: Niles Godrich is a Grammy-winning producer who's worked with Paul McCartney. He says one of Martin's great gifts was arranging. GODRICH: You know, as an arranger, you write the notes. You listen to the music that exists, and you score your parts using the orchestra. So he was very much a musician. And countless times on Beatles records - I mean, it's everywhere. It's all over them. BLAIR: Martin was known for experimenting in the studio. In 1998, he told NPR about one of the songs the Beatles first played him. He hated it. GEORGE MARTIN: It was a real dirge. Is very, very slow and very boring. So I said, look; if you double the speed of that, you might have something. But otherwise, forget it. BLAIR: They took his advice, and the song "Please Please Me" was a hit. BEATLES: (Signing) Come on. Come on. Come on. Come on. Come on. Come on. Come on. Come on. Please please me, oh yeah, like I please you. BLAIR: George Martin's total embrace of music started before he met the Beatles in the early 1960s. After serving in World War II, he studied composition and orchestration, piano and oboe at London's Guildhall School of Music. He recorded jazz artists, Scottish dance bands and comedy albums. He brought all of that knowledge and experience to the Beatles. It was Martin's idea, for example, to add strings to "Yesterday" and "Eleanor Rigby." BEATLES: (Singing) Let me take you back 'cause I'm going to strawberry fields. BLAIR: ...Into songs like this. BEATLES: (Singing) Let me take you down 'cause I'm going to strawberry fields. BLAIR: In his autobiography, Martin said that it was a lovely, gentle song and that it should stay that way, but John Lennon wanted to turn it into a heavy rock number with drums, bass and electric guitars. Martin lost that battle at first. The band recorded the song Lennon's way, but a week later, Lennon admitted he'd been wrong. Martin went on to score "Strawberry Fields Forever" with cellos and trumpet. BLAIR: George Martin was an expert at keeping the balance between texture and simplicity. He could add instruments but knew when to stop. MARTIN: You keep adding colors, you start getting muddy. And they run, and they get indistinct. If you can get your effect with a certain degree of cleanliness, then I think it's much better than overloading things. BLAIR: Sir George Martin's influence on generations of record producers is deep. As Nigel Godrich puts it, Martin is a kind of spiritual godfather of producing. Elizabeth Blair, NPR News. Transcript provided by NPR, Copyright NPR.